Cable S03VV-F 4G0.75 LNR.6, 4conduct., 0.75mm², copper, gray Cable S03VV-F 4G0.75 LNR.6, 4 x 0.75 mm2, gray. Cable S03 VV-F 4G0.75 LNR, 4conduct., 0.75mm², copper, black Cable S03 VV-F 4G0.75 mm2 LNR, black. Power cable with cable shoes, 1.5m Power cord with cable shoes, 1.5m long and 3x1.5mm wire cross section. List Price 0.85лв. VAT Incl. 0.80лв. VAT Incl. 0.76лв. VAT Incl. 0.73лв. VAT Incl. List Price 1.10лв. VAT Incl. 1.05лв. VAT Incl. 0.99лв. VAT Incl. 0.94лв. VAT Incl. HVPS (H05VV-F) cable 2 x 2.5 white CFRC cable 2 x 2.5 mm2, white with flexible copper wires. 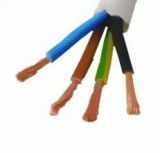 CFR (H05VV-F) cable 2x4 white CFRC cable 2 x 4 mm2 with flexible copper conductors. List Price 2.35лв. VAT Incl. 2.23лв. VAT Incl. 2.11лв. VAT Incl. 1.99лв. VAT Incl. List Price 1.35лв. VAT Incl. 1.28лв. VAT Incl. 1.22лв. VAT Incl. 1.15лв. VAT Incl. List Price 2.10лв. VAT Incl. 1.99лв. VAT Incl. 1.89лв. VAT Incl. 1.79лв. VAT Incl. List Price 3.40лв. VAT Incl. 3.23лв. VAT Incl. 3.06лв. VAT Incl. 2.89лв. VAT Incl. List Price 0.85лв. VAT Incl. 0.81лв. VAT Incl. 0.77лв. VAT Incl. 0.72лв. VAT Incl. H05VV-F cable 4h0.75mm2 double insulation Four-core H05VV-F cable with double insulation 4x0.75 mm2. FROR 4G1B cable 4x1mm2 FROR 4G1B cable 4x1mm2, class 5. List Price 1.55лв. VAT Incl. 1.47лв. VAT Incl. 1.39лв. VAT Incl.